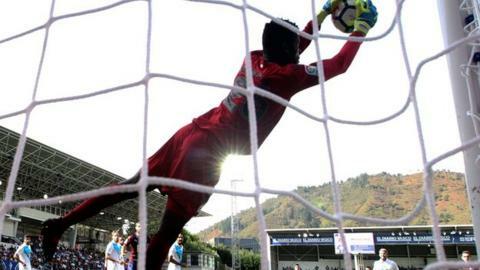 Former Nigeria U-17 goalkeeper Francis Uzoho hailed a memorable Deportivo La Coruna debut after keeping a clean sheet in Sunday's 0-0 draw at Eibar. The 18-year-old, who arrived at the club from Qatar's Aspire Academy in January, produced four important saves to help Deportivo claim a point. "A day that will never disappear from my memory - my debut - thanks all for the support," he said on Twitter. Uzoho is the youngest foreign goalkeeper to ever play in La Liga. At 18 years 11 months and 17 days, he becomes the second youngest player in La Liga this season, behind Real Madrid's Moroccan defender Achraf Hakimi - who made his debut at 18 years 10 months 27 days earlier this month. Uzoho follows in the footsteps of Wilfred Agbonavbare and Peter Rufai as Nigerian goalkeepers to have played in the Spanish top flight. "A coach has to act according to the things he sees in training," Mel said. "He is only 18 and he can barely speak Spanish but I know what he can offer this club." Uzoho will be hoping he has done enough to make a second appearance when Deportivo host Girona on 23 October. The goalkeeper was part of the victorious Nigeria squad at the 2013 Fifa U-17 World Cup in the United Arab Emirates, albeit without playing a single minute at the tournament. Deportivo have a long history of giving African goalkeepers opportunities. Rufai, who won the Nations Cup with Nigeria in 1994 and appeared at two World Cups, played for the club between 1997 and 1999. Yet the most successful African spell in goal came via former Cameroon international Jacques Songo'o. In the first of two spells with the club, he won the Ricardo Zamora trophy - awarded to the Spanish top flight's best goalkeeper - in 1997 before helping to claim the club's only La Liga title in 2000. In May 2004, during Songo'o's second spell with Deportivo, a late substitute appearance established the Cameroonian as the then second oldest player - at 40 - to feature in a Spanish first division game.